You can try grinding it into a flour and then mixing it 1 : 1.5 of glutinous rice flour and enough coconut milk along with a pinch or two of salt into a dough. Roll them into small marbles, oil and steam them on banana leaves for 20 mins or so. Serve with thickened, sweetened coconut cream and mangoes or caramelised bananas. Yes Khew, this is also my recollection of how kakanin artisans in my town used the costlier pirurutong, as a colourant and flavouring, hardly ever as single or stand-alone main ingredient. Not counting myself among those people who love purple, the regular Tagalog suman made from salted inangit is my preferred accompaniment to ripe mangos. This far superior pairing dominates my fondest memories of the months of May of my youth which leaves what’s on offer here, usually the popular Thai version, wanting. That has been my problem, when I mix purple rice with the white glutinous rice. The purple rice still isn’t cooked while the white rice is lata already. Must try what Khew said, the next time. This reminds me, one time I brought with me a pound of purple sweet rice. My friend cooked the whole thing! I was so dismayed as I was planning to just use a few spoonsful at a time just enough to give color to the white rice. These are of course filled, and plain water used to form the dough, but coconut cream would give it some tenderness. You could also add mashed ube instead of coconut cream to make them less rubbery. MM…check out this site, She Simmers, my favourite site for Thai cooking. 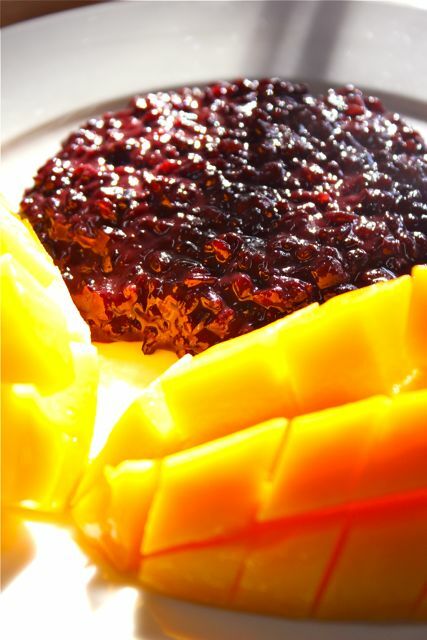 She has a Thai dessert recipe for Black Glutinous Rice Pudding, much like our champorado. However, if you decrease the water but follow her method of cooking it, you would have the consistency you are looking for. 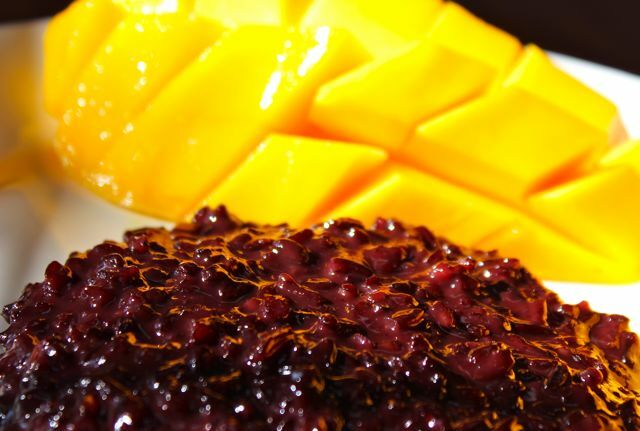 If you still have leftover black glutinous rice made, mix it with partially cooked malagkit done in rice cooker with coconut milk and a bit of the purple soaking liquid of the black rice sweetened with a bit of sugar and pinch of salt. Add some puréed langka and wrap in young banana leaves and then steamed….you will be in a suman coma for you cannot just stop with 1 suman. That is why I have stopped making this suman! Now, if you are into latik, save the coconut oil! Add a bit of the oil as well into your suman mixture. This is my secret ingredient when I make the purple suman or just the plain white suman much like Footloose’ Inangit! Stop it bettyQ! I don’t want to be in suman coma but I did try cook pirurutong by itself, soaked it for almost a day and I ended up cooking it again with regular sticky rice to get it to eating consistency. Glad you surface from time to time from your hibernation from this blog, cheery as ever and never without cooking tips! As I said we need to hear from the older ( not necessarily in age but as commenters in this blog) from time to time so we know you are still with us. I remember “silly lolo” who we never heard from for a good while until we heard sadly of his passing from Veronica, his daughter. Our get together in Cebu never materialized:( Footloose is not missed with his insightful comments and there is always something to be learned from him. Marketmanila’s 2,000th Post and Ranked as the 22nd Most Visited Blog in the Philippines!